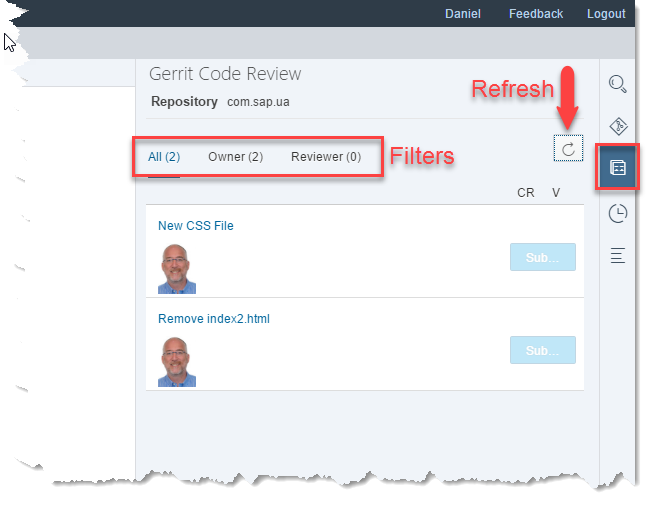 There’s been a new Gerrit pane in SAP Web IDE for a few weeks now, but the latest release includes the ability to submit and merge changes in Gerrit from within the IDE. The first thing you need to do is to clone the repository and make sure you indicate to SAP Web IDE that the repository uses Gerrit. 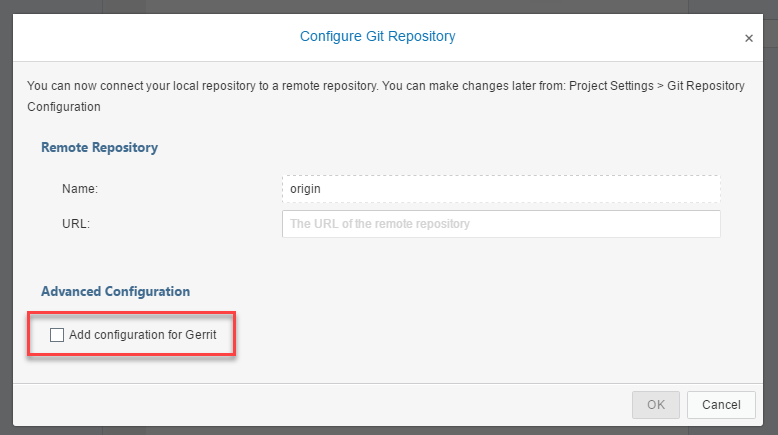 If, instead of cloning an existing repository, you initialize a new repository and then set a remote repository for it, you also need to indicate that the remote repository uses Gerrit. Click the refresh button . Your changes are shown. If your the owner, you’ll see your picture (and your name if you hover and view the tooltip). You can use the filters to see only the ones you committed or only the ones for which you are reviewer. To see the change in your Gerrit system, just click the name of the change. If the change has been code reviewed, you’ll see a check under CR, and if it is verified you’ll see a check under the V.
If your change is ready to be submitted, then the Submit button will be enabled and you will be able to submit it. Once submitted, it will be removed from the list in SAP Web IDE and it will be merged into the code. 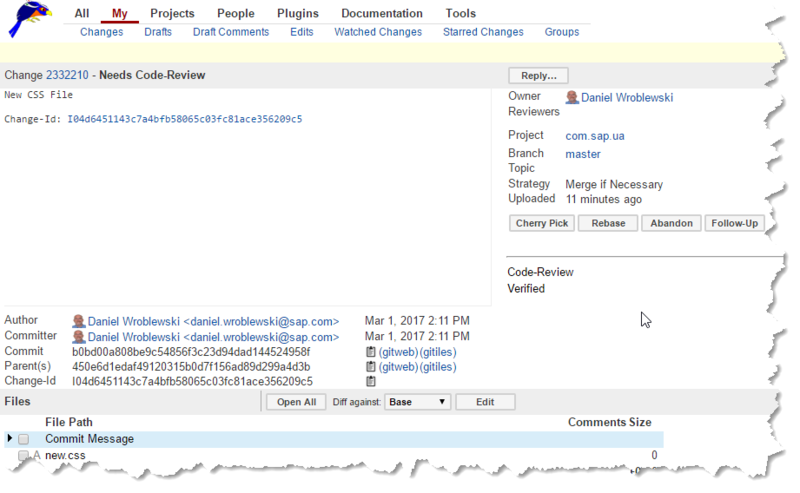 do the Git Repositories in SAP Cloud Platform work with Gerrit or do we need other Git Repository? No they don’t. Generally the gerrit workflow is for cases where you have git on premise with gerrit. Does that work on a local (on-premise) HANA XSA as well? With a local gerrit? Unfortunately, it doesn’t work in Web IDE for HANA. In trail instance, Gerrit Pane is not visible , what could be the reason ? The Gerrit pane only shows if the Preferences | Git Settings | Show Gerrit Pane checkbox is checked. Not sure if it is checked by default. Yes, Gerrit is not checked by default. We have licensed SAP WebIDE. Does Git Repositories in SCP support Gerrit ? That is a question we get quite a bit. No, I don’t believe the Git in SAP Cloud Platform offers Gerrit. Uri Nizan , Yuval Morad : Do you have any more information about this? I’ve been out of this area for a while. Paola Laufer Do you have more to say here? This is how it was when I was working with it. Uri Nizan Is this still the case?